Way back in the summer of 2010 (wow, where does the time go? ), I was very pleasantly surprised with Oyatsukai’s Final Freeway [Free], an homage to Sega’s classic OutRun arcade racer. You could tell straightaway that there was plenty of love put into Final Freeway by somebody who absolutely adored the source material, and unsurprisingly this love translated into fun gameplay for those craving an on-the-go OutRun-alike. While we praised Final Freeway in our review, it was missing a couple of core components that make an OutRun game, well, OutRunny. First was a lack of branching paths when you reached the end of a track segment, which normally would allow you to choose your own path to the end of the race. Instead Final Freeway was just a straight shot through its 6 environments. The second big thing that was missing was the ability to crash and flip your ride. Sure, this is just a visual thing that doesn’t really affect gameplay, but it can’t truly feel like an OutRun game unless you can barrel into a tree at 160mph, flip your vehicle through the air several times while the passengers are ejected, and have both the car and the people come out completely unscathed. Also, where was the pretty blonde riding shotgun? Maybe she was there, but since the car wasn’t a convertible in Final Freeway, I’ll never know for sure (these things matter). So there you have it, Final Freeway was an awesome OutRun clone with a few minor flaws. 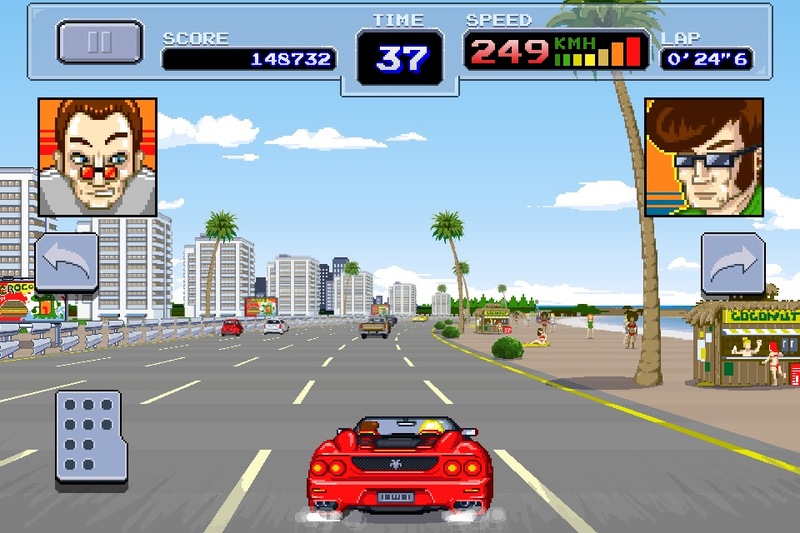 Fast forward to earlier this month, and Oyatsukai has taken all the feedback from the original Final Freeway and put it into the sequel, Final Freeway 2R [99¢], which truly is the OutRun game we’ve been waiting for. All the things we felt were missing from the first game? Those are in Final Freeway 2R, and it even does a couple of neat new things that really differentiates itself from OutRun while still retaining the feel of that series. The first big thing in Final Freeway 2R is that there are now 13 different environments to race through in total. Each complete game has you racing through 5 of them, with a branching path at the end of each that lets you pick which route to take. It’s super OutRunny! Also, the graphics look a lot better this time around, with more detailed sprite work and a greater draw distance. The sense of speed in Final Freeway 2R is just ridiculous, and puts most other racers to shame. All the while it runs at a rock-solid framerate. Of course, you can also now flip your ride in Final Freeway 2R, which as I’ve explained is incredibly crucial to the experience. You get a convertible faux Ferrari this time too, so you can actually see your blonde lady friend sitting in the passenger seat. In a cool twist over the original, you can now choose from 3 different drivers in Final Freeway 2R, each with their own set of stats. One of these drivers actually is the blonde cutie, and when you pick her one of the other fellas ends up riding shotgun. Equality! 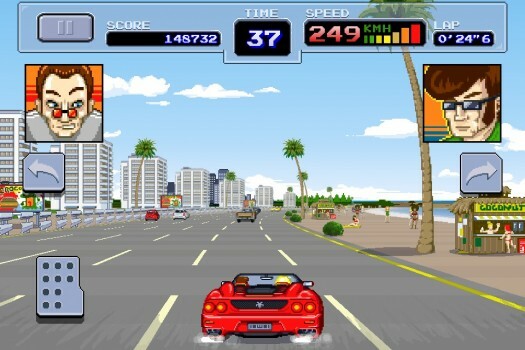 One other interesting change from OutRun is now you actually have a rival of sorts shadowing you through each environment as you race towards the end goal. If you manage to reach the end of a track segment before he does you’ll get an additional bonus. It’s not integral to the overall experience, but it does add a nice bit of extra motivation to actually have an opponent to race against rather than merely trying to beat the clock. Overall, Final Freeway 2R is a huge improvement over the original, and I just can’t believe how hooked I’ve been on it since it came out. It’s just pure, simplistic, fast-paced, arcade racing fun. If you’re not really an original OutRun fan but are curious if this sort of gameplay is your thing, then for today only you can grab the first Final Freeway for free to see how it grabs you. If you like that, then just know that Final Freeway 2R improves on everything from the first and will set you back just a buck.